Although reports on the Census Bureau’s New Residential Construction release usually emphasize housing starts (and may mention permits), the number of homes under construction is also worth looking at, and at this time is a particularly good indicator of sustained recovery in the home building industry. The Census Bureau’s latest release shows that the seasonally adjusted number of homes under construction has now increased for 27 months in a row, going from 413,000 in August of 2011 to (a preliminary estimate of) 685,000 in November of 2013. 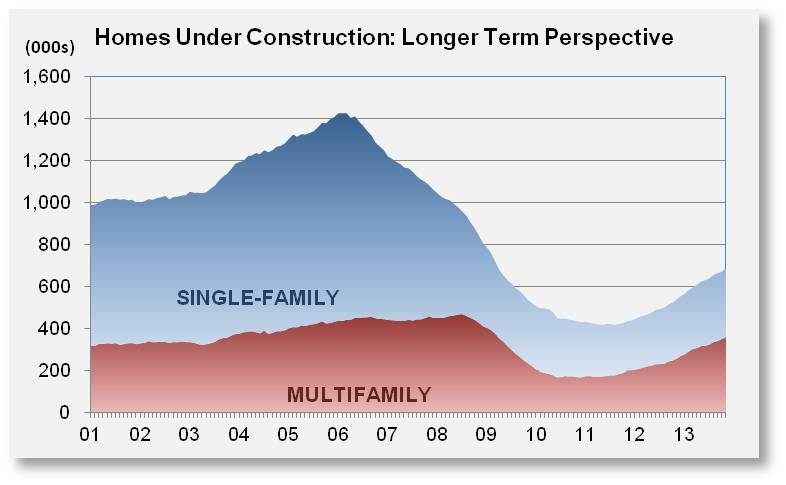 The increases have come from both single-family and multifamily construction. The number of single-family homes being built rebounded in November after dipping slightly in October—but prior to that had increased for 21 straight months, with the changes taking us from 236,000 in December of 2011 to 329,000 in November of 2013. Meanwhile, the number of apartments under construction was flat in July of 2012, but otherwise increased every month from August 2011 to November 2013, going from 174,000 to 356,000 over that span. During relatively stable periods, there’s a rough balance between starts and completions, and the number homes being built is likely to fluctuate in either direction. But during a strong sustained trend, the normal balance may be disrupted as the time it takes to build a home speeds up or slows down and the numbers of housing units moving into and out of the pipeline at either end diverge. In times like that, movement in the number of units under-construction can be very persistent. During the latest housing downturn, for instance, the number of homes under construction declined every month for over four straight years, with the declines continuing well after it appeared starts had bottomed out. Now, the “under construction” series is providing some of the most consistent evidence of the industry’s ongoing recovery. The number of homes under construction is also of interest, because it’s the most direct determinant of the demand for labor. NAHB has estimated that, nationally, building an average single-family home requires enough labor to keep 3.05 people employed full-time for a year (including the upstream effects of jobs in manufacturing and product distribution), and an average rental apartment requires enough to employ 1.16.